Home Sweet Home: Window Makeover? If you already feel bored with your bedroom or your reading nook, why don't you try to add life by using satin ribbons of various colors. Got this idea from femalenetwork when they featured this article called "Curtain(Re)Call", which was originally published in "Real Home" section of Real Living Philippines. They actually featured there 6 different DIY projects for a window makeover. But this idea of using satin ribbons is my personal favorite. I don't know though how many rolls of ribbons will you be using for this project. I suppose, it would be around several rolls. But this is a very simple project as there is no sewing and cutting required. 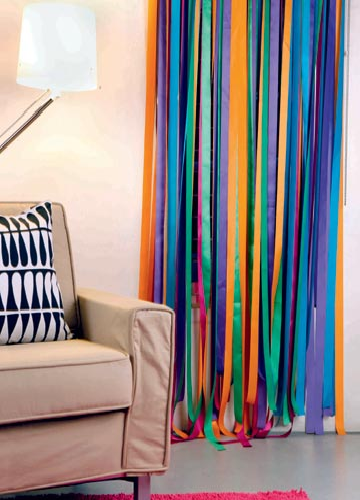 All you have to do is to tie strips of colored ribbons around the curtain rod and you are on your way to a cool DIY curtain full of colors. Maybe, I would be trying this one. What do you think? Oh Wow! Nice idea! This is terrific! Alam mo bang nabobore nako sa look nitong room namin kaya ive been going to malls just to buy new curtains and table covers para lng maging alive ulit ang atmosphere. Sadly theyre all dull pa din and di ko type ang styles. And then this post happen to give terrific idea! Thanks sis! Ill be searching around for colorful ribbons this weekend. Rainbow motif na lang nga para my thrill. Ikaw na talaga!! !